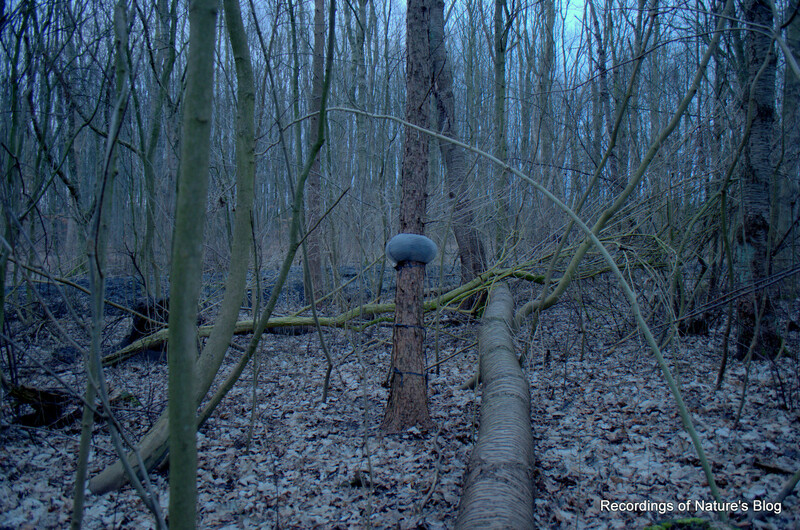 Hereby yet another night audio recording from Brøndbyskoven 30.3.2018, same place as last time in January -just to check out what is happening in the forest at this time of the year. It has been a cold late winter/spring and hardly a single sign of spring can be seen in the forest at the moment. It even looks more winter now than in January! The cold soil leaves the plant and insect life to a minimum, which also affects the bird activity. 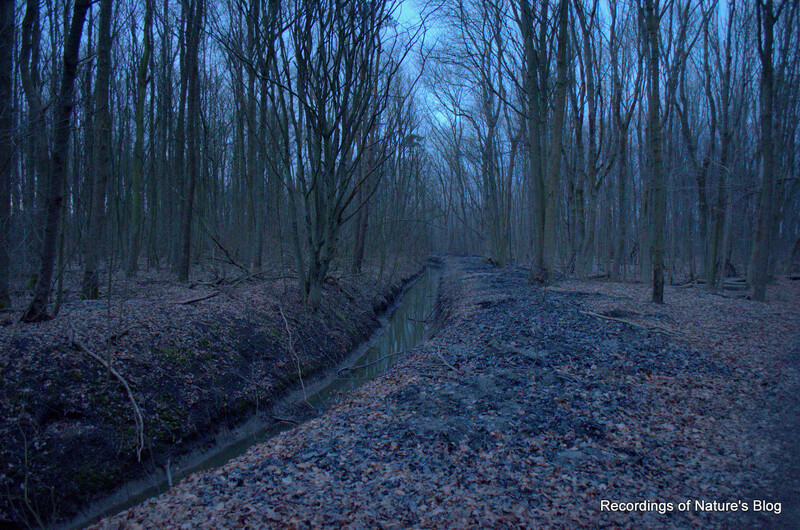 All contributing to a very silent forest ambience, which is surely reflected in the recording. The clip starts at 0:45 am and ends 1:30 am. What to hear is mainly the silent forest atmosphere dominated by lots of traffic noise. Once or twice a fox is heard sniffing around but otherwise the forest it self is only heard by very faint rustling sounds from the forest floor. Unfortunately, my memory card ran out during the middle of the night, so I didn’t get the birds’ morning chorus on this take. Listen i headphones. The winter 2018 has be quite unusual, and I think, quite harsh to plants and animals. It all started with typical mild December and January, and in the middle of February there was a sense of spring in the air with geese collecting in the parks, a bit of black bird song etc. However this all ended abruptly as a Siberian cold snap turned the land into a deep freezer for the remaining part of the month. This was finally followed by milder weather, but only again to be replaced with yet another cold wave. 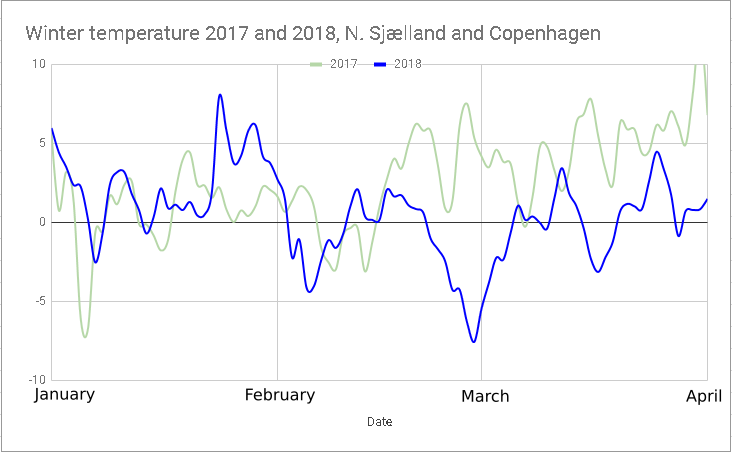 And so it continued throughout March, as seen on the figure above showing the winter temperature 2018 compared with 2017. I think this kind of weather is really hard to birds, animals, insects and plants. They must be getting really impatient now. I think spring is ready to explode any time now, as soon as the temperature rises to normal. Weather during the night was calm wind from East, and temperature dropping to about -1C. Dry road surfaces. Weather Source: DMI, and curve data grabbed with the http://www.graphreader.com plot digitizing online tool and Google Sheets.